Improve your sight-reading by practicing it with a partner, a partner who helps keep the pulse moving. Of course, we learn to keep our eyes on the page and always look ahead. We know to scan for surprises of meter, accidentals or key change. We know, too, that setting reasonable tempos based on the fastest note values ensures a successful performance. But in the final analysis, we must learn not to stop for mistakes, the wayward flat, a dangling mordent or what-in-the-world-kind-of-scale was that anyway. It would be rude to abandon a partner in search of the aforementioned, so it is the duty of each to keep the other on track. 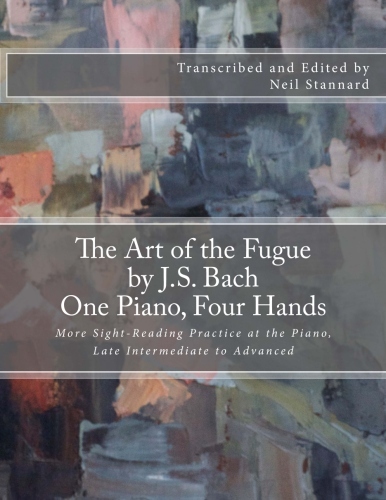 Designed for partners of equal skill, this volume includes all 14 fugues and four canons in Bach's original work, the one he was working on at the time of his death. Only number 17 is omitted, as it requires two keyboards. I have also included solo versions of some of the two-part canons to be enjoyed while waiting for the partner to arrive. In order to improve sight-reading skills, I often suggest to students that they keep some scores on their piano that are several levels below what they can actually manage technically. One excellent resource is the church hymnal. These mostly homophonic melodies, some familiar, can usually be managed at sight if we find the right tempos. The absence of counterpoint makes this material more readily sight-readable. For the more advanced pianist, however, pieces with the added challenge of contrapuntal textures can be a way to advance reading skills and stimulate musical sensibilities. Which brings me to J.S. Bach’s The Art of the Fugue. Begun in the 1740s and left unfinished at his death in 1750, in The Art of the Fugue Bach once again has the last word on a given subject. His apparent intent was to explore as many contrapuntal techniques as possible using a particular theme, a summation, really, of his life’s work. Incomplete though it is, the master accumulated here fourteen fugues and 4 canons on some variation of his theme, infusing each in succession with ever increasing complexity. Some authorities argue that this collection was meant as a compositional study guide, not intended as performance material. In this context I offer up the solo cello suites as evidence to the contrary. Until the cello suites fell into the hands of the legendary Pablo Casals, they, too, were considered only exercises. All of these fugues were written in open score with no indication of instrumentation, except for number 17, which bears the note “fugue for two keyboards.” (I omit this two-keyboard fugue.) Nevertheless, they can be managed quite nicely on a keyboard, or in various instrumental ensembles which, according to the distinguished pianist and musicologist Charles Rosen, was the intent. To the best of my knowledge, The Art of the Fugue has never before been transcribed for piano duet. Difficult to play with two hands, with four they make excellent and enjoyable fodder for sight-reading, albeit with some challenges. 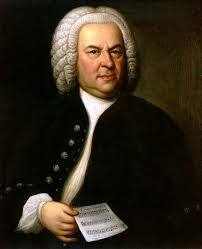 I have tried to maintain Bach’s voice-leading as much as possible, though it seemed prudent to relocate voices in cases where collision would be unavoidable, particularly between tenor and alto voices when present in the right hand of secondo and left hand of primo. Incidentally, if you are new to duet playing, be considerate of your partner by getting out of the way as soon as possible. You will notice occasional crossing of voices when they can be negotiated by one player. 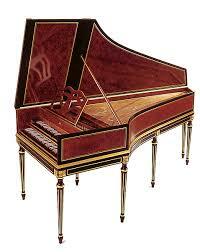 Should we imitate the harpsichord? Articulation can be a matter of some contention among performers, particularly among keyboard players who feel—and those who don’t—that virtually every note should be played detached in imitation of the harpsichord. We have evidence in Bach’s own hand that he favored a cantabile style of playing, which he declares in the introduction to the “Inventions and Sinfonias” as follows: One of the purposes of these pieces [the Inventions] is to “above all develop a cantabile style of playing (am allermeisten aber eine cantabile Art im Spielen zu erlangen).” Since these fugues and canons were offered in open score, it seems reasonable to imagine they might be played by strings or winds, which could imply a different style of articulation than that of a harpsichord. So, my advice is to think musically in a global sense. My metronome and dynamic indications are only guides and not to be taken too literally. Remember, when sight-reading the right tempo is the one that allows continuity. You will find in my version the addition of solo incarnations of some of the canons, which may be enjoyed while waiting for a partner to arrive. Also, I have separated the rectus and inversus from the open score so that they can be played individually as intended. A pianist writes: "My right hand trilling is not consistent. In the opening to Chopin Op. 55 No. 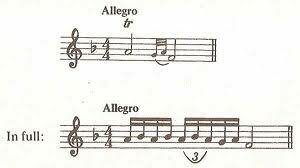 2, for example, I have serious trouble playing that trill without choking up. I've heard 'think about your fingers going up, rather than down' but that doesn't work. Sometimes, every now and then, I can trill effortlessly with control. But most of the time, it chokes up. I feel like I have some sort of coordination problem." Yes, this writer has a coordination problem. A trill sign is a symbol, and like all symbols it represents something larger than itself. The most common mistake pianists make, a mistake resulting in tightness or jamming of the trill, is conceptual. That is, a trill must have a place in time, a rhythm. This is true of all ornaments indicated by symbols, and they should be practiced with pulses—felt, not necessarily heard—until they become second nature. First decide on the number and rhythm of notes that will fit in the space allotted and then decide how those notes coordinate with the other hand. Remember, too, that ornaments should reflect the expressive content of their context. In the example offered, Chopin's Nocturne Op. 55, Number 2, a machine-gun trill seems inappropriate. As a matter of technique, a trill is a changing of direction with every note, like an Alberti figure. If the forearm is not allowed to rotate in its axis, albeit very slightly, the trill can jam. Cutting off the fingers/hand from the forearm is always a mistake. Do not think of lifting the fingers up and down, although they are somewhat active. Rather, maintain contact with the key, riding it (more or less) and allowing the forearm its freedom. Work the trill up slowly in rhythms, i.e. eighths, triplets, sixteenths, etc. If tightness or fatigue set in, the movement is incorrect.